The UK electricity market faces a changing generation mix, an uncertain policy landscape and a tightening capacity margin. In this environment generation flexibility will be a key driver of portfolio value. A strong investment case can be built around the value of older CCGT flexibility, particularly given the challenges faced by investors in new gas plant. However this investment case depends on effectively valuing and hedging plant flexibility, and recognising the changing dynamics of gas plant returns. Note: A version of the following article was published in the October 28th edition of Utility Week. The replacement of retiring thermal plant with renewable generation capacity is a cornerstone of the UK government’s Electricity Market Reform policy. At first glance this seems an attractive objective in the context of the enormous challenge the UK faces in decarbonising its power sector. But some basic analysis of the UK capacity balance reveals that investment in gas-fired plant, rather than renewable capacity, is the key to security of supply this decade. Gas plant provides both a reliable source of baseload generation output and the flexibility to back up increasing volumes of intermittent renewable generation. However investors in new gas plant are faced with weak forward market margins, the threat of reduced running hours and an uncertain policy landscape. In this environment an interesting investment case can be built around the flexibility of existing gas plant. It is likely that the UK will need to replace somewhere between a quarter and a third of its approximately 85GW of installed generation capacity this decade. Plant retirements will be dominated by coal, oil and nuclear capacity, with 20GW of plant scheduled to close for regulatory reasons by the end of this decade (the majority by the middle of the decade). In addition, the owners of the large volume of gas-fired CCGT plant built in the 1990s ‘dash for gas’, face the decision to close their plant or undertake major capital investment to extend plant lives. This decision typically comes into focus at around 20 years of plant life, and given the volume of plant involved, will have a substantial impact on security of supply. Of the 19GW of CCGT capacity built in the 1990s, about half will reach 20 years of age by the middle of this decade, the other half by 2020. On the other side of the capacity equation the options for replacing retiring capacity are somewhat limited. Conventional coal (due to the government’s Emissions Performance Standard) and new nuclear (due to development timelines) can not play a meaningful role until beyond 2020. The contribution of carbon captured plant will almost certainly be limited to demonstration projects given the cost of CCS technology and the lack of clarity around policy support. That leaves renewable and gas capacity to fill the gap. Rates of renewable plant build will depend not only on levels of government support (yet to be announced) but also on planning and investor capital constraints. Even with generous assumptions about increases in renewable build rates from historical levels, it is difficult to see new renewable capacity contributing more than 5 to 7 GW of effective capacity by 2020, once installed capacity has been ‘de-rated’ for average plant load factors. This leads to the conclusion that new CCGT plant and life extensions of existing gas plant will need to play a pivotal role in maintaining an orderly UK capacity margin. The fact that gas plant is critical to security of supply does not mean that the conditions are in place to support new build. The project economics of new CCGT plant have traditionally relied on securing healthy forward market margins at high load factor, at least in the early years of a plant’s life. However investors in new CCGT currently face the combined threat of weak forward market margins and reduced load factors as the market share of ‘must run’ renewable output increases. As intermittent renewable generation increases, gas plant returns are becoming increasingly concentrated into periods of high demand and low wind. This environment makes it more difficult for an investor to commit to the upfront capital cost required to build a new CCGT plant. Gas plant investors face the additional challenge of an uncertain policy environment. The government’s recently announced carbon price floor increases generation costs, while other Electricity Market Reform policy interventions weaken the market price signals that drive gas plant returns. The government is yet to announce details of a Capacity Mechanism which may provide some support for gas capacity. However two of the UK’s largest thermal generators, RWE and E.ON, oppose a Capacity Mechanism on the grounds that it is likely to introduce further market distortions. The level of policy uncertainty is far from conducive to new gas plant investment. The alternative to new build is the life extension of existing CCGT. Investment in life extension has a much lower capital cost hurdle, in the order of 10-20% of a new build project cost. This must be balanced against the constraints of an older plant, particularly lower plant efficiency and reliability. Older CCGT must contend with lower average load factors as newer more efficient plant are dispatched in preference, although the efficiency difference is typically only 3 to 5%. This means that plant returns tend to be more variable and more complex to hedge. But the redeeming feature of an older gas plant, and its main value driver, is its flexibility. Older CCGT plant present an interesting investment proposition, particularly given the threats faced by new plant from weak forward market margins and lower load factor running. These threats also mean that older gas capacity can currently be acquired or contracted relatively cheaply. However the investment case for an older CCGT must be built around an understanding of the value of plant flexibility. Firstly, an older CCGT plant benefits from the investment flexibility to (i) extend the plant’s life (ii) replace it with a new plant if returns recover or (iii) mothball the plant in times of poor return. This investment flexibility has a significant value given current levels of commodity price volatility and the security of supply uncertainty facing the UK power market. Secondly, older gas capacity benefits from operational flexibility. An older CCGT has relatively little value as measured against current forward market prices (intrinsic value). However a plant has a relatively high value associated with its flexibility to respond to changes in market prices (extrinsic value). A simple illustration of this concept is provided in Chart 1. The ability to access the extrinsic value associated with flexibility without having to pay up for intrinsic value presents an interesting value opportunity, particularly for market players looking to insure their portfolios against the risks associated with a tightening UK capacity margin. The key challenge for the buyer or owner of an older CCGT is how to effectively manage and realise plant value. Extrinsic value is more complex to quantify than intrinsic value, given its dependency on unobservable parameters such as the volatility and correlation of the underlying power, gas and carbon prices. Traditional plant valuation methods which focus on forecasting spot prices tend to significantly underestimate the value of plant flexibility. However there are a range of more sophisticated approaches that can be used to analyse and monetise flexibility value. 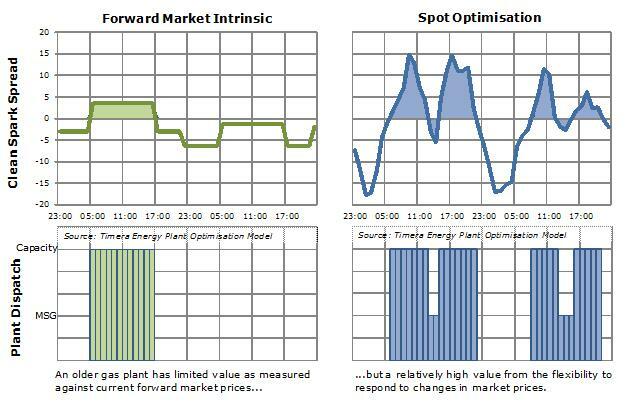 These techniques recognise the uncertainty faced by a plant investor and focus on optimisation of the plant in the spot and balancing markets while allowing for dynamic hedging of the plant’s forward market exposures. The UK electricity market faces a changing generation mix, an uncertain policy landscape and a tightening capacity margin. In this environment generation flexibility will be a key driver of portfolio value. A strong investment case can be built around the value of older gas plant flexibility, particularly given the challenges faced by investors in new gas plant. However this investment case depends on effectively valuing and hedging plant flexibility, and recognising the changing dynamics of gas plant returns.